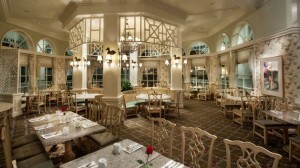 Disney’s Grand Floridian Café is a hidden gem, located at Disney’s luxurious Grand Floridian Resort and Spa at the Walt Disney World Resort! This table service restaurant can be found just off of the resort’s main lobby. It is quite, tucked away and truly grand! The restaurant’s décor and atmosphere is themed in an elegant and Victorian style just like the rest of this beautiful resort. The menu here has something for everyone. It is classic comfort food done in a sophisticated style! My personal favorite that I get every time is The Café Sandwich. This hot sandwich is served open-faced with ham, roasted turkey, bacon and tomato. 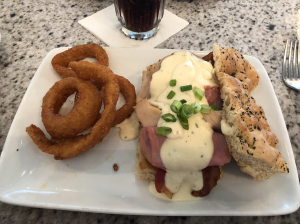 It is then topped with a creamy boursin cheese sauce and served with a side of freshly made onion rings. 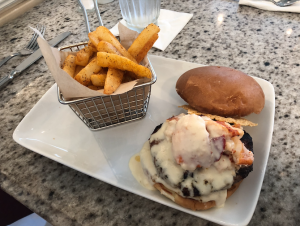 Other popular items here include the Lobster ‘Thermidor’ Burger, the Buttermilk-fried Chicken and Miso-glazed Salmon. During breakfast and lunch this restaurant features the same brunch-style menu. A well-known item here is the restaurant’s benedicts! They offer eggs benedict in several variations including the Traditional Eggs Benedict, the Spicy Chorizo Benedict and the Lobster Benedict! If you can’t make up your mind you can go for the Benedict flight which has all three of these signature benedicts! I recommend this dining location as a great place to escape Magic Kingdom mid-day to come have a wonderful meal. You can easily access the Grand Floridian from the Magic Kingdom via a boat or monorail. Your commute over to the resort from the park take only a few minutes so coming here for a meal is a great time to take a break from the hustle and bustle of the parks. You can sit down and relax at one of Disney Worlds most peaceful resorts and allow yourself to refuel and be refreshed to then head back into the parks for an awesome night! If you want to see my most recent experience at this wonderful restaurant then check out our most recent YouTube video! Contact your Kingdom Magic Vacations Travel Planner today to plan your next visit to the Walt Disney World Resort or to any destination that you are dreaming of visiting next! 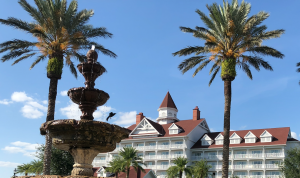 This entry was posted in Disney Dining, Disney Fairy Tale Weddings, Disney Parks, Disney Resorts, Disney Restaurants, Disney Vacation, Magic Kingdom, Walt Disney World Resort - Orlando, Walt Disney World Speedway and tagged disney, disney world, Disney's Grand Floridian, Grand Floridian Cafe, magic kingdom, Walt Disney World Restaurants on February 5, 2019 by Megan Przychodzien.